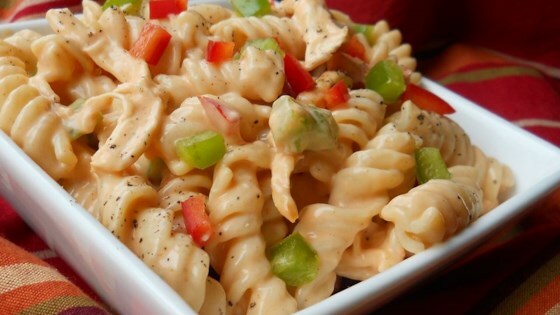 "For anyone who likes Buffalo wings, this is a great change of pace from normal pasta salad. Really popular as a side dish for a barbeque or just about any gathering you can think of. You can substitute or add many different vegetables with this recipe." Stir together the mayonnaise, blue cheese dressing, buffalo wing sauce, salt and pepper in a large bowl. Add the chicken, bell peppers, red onion, and cooked pasta and toss to coat with the dressing. Cover and chill at least 1 hour in the refrigerator before serving. I used a rotiserie chicken and it was fantastic! I made this for my son's daycare workers to thank them for a great year and they all RAVED about it. Great recipe!